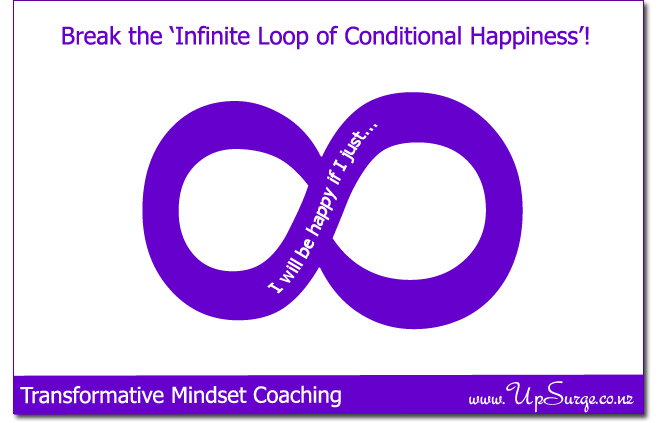 Are you stuck in an ‘Infinite Loop of Conditional Happiness’? Do you ever have the feeling you are perpetually preparing to be happy? Putting in the hard yards before you get to reap the rewards of your efforts. Do you hear yourself say things like “When I get through [fill in the blank around learning, illness, busyness etc] then I would be happy” or ‘If I just [lost weight, had more money, found the perfect partner etc] then I would be happy’? Emm, the hammering moles theory of happiness would suggest our approach is flawed – the moles are just gonna keep on coming. So if we accept this how do we escape our ‘Infinite Loop of Conditional Happiness’? How about if we gave ourselves permission to happy regardless of the size, frequency and persistence of our moles? I have a beautiful friend who has faced so many challenges around her children’s health and yet the first thing she says is ‘I have nothing to complain about’. She is still smiling despite standing there with vomit on her shoe after her little man was sick getting out of the car and not having had an uninterrupted night’s sleep in over a month. She is truly inspiring – her happiness is not conditional on the events in her life – she unselfishly radiates fun and vitality to the world and sees her challenges as another bump in an otherwise wonderful road. Her attitude makes molehills our of mountains (ok, I will stop with the mole theme – I think I’ve pretty much milked that one…). Putting off happiness until life’s challenges pass is like investing in a bogus retirement plan – you forgo happiness today hoping to have lots later but there is no payout at the end because you never meet the criteria ie. life will always have challenges. I am not saying that some events aren’t really challenging and that we just knock back the Prozac and slap on a smile. To feel is to live. But we can help ourselves by doing a bit of expectation management. There will always be challenges and we can look at these situations as growth opportunities or injustices. Our lived experience depends on our perspective. Personally, I want don’t want to give away my power to be happy to a bunch of moles (opps, I was going to move on from the mole fixation – I keep coming back because it reminds me of a couple of girls I was bullied by at school), after all they are inevitable. How about next time you find yourself surrounded by moles, look at them as opportunities to learn about yourselves and develop grace, resilience and kindness (and other yummy qualities that we admire in ourselves and others). This way you can practice living in an ‘Infinite Loop of Unconditional Happiness’ – now that’s a loop that is worth being stuck in!